18. what we’re really thinking. Thanks, PittGirl, for an awesome three years. Take care, OK? So tell me about this used furniture store, jerk. Boy you got that right. She wasn’t that good of a writer, wasn’t funny at all, very self important, and mega narcissistic. This weeks past events prove this. The embracing of simplemindedness and medocrity in this town kills me. This is not the end of an era. 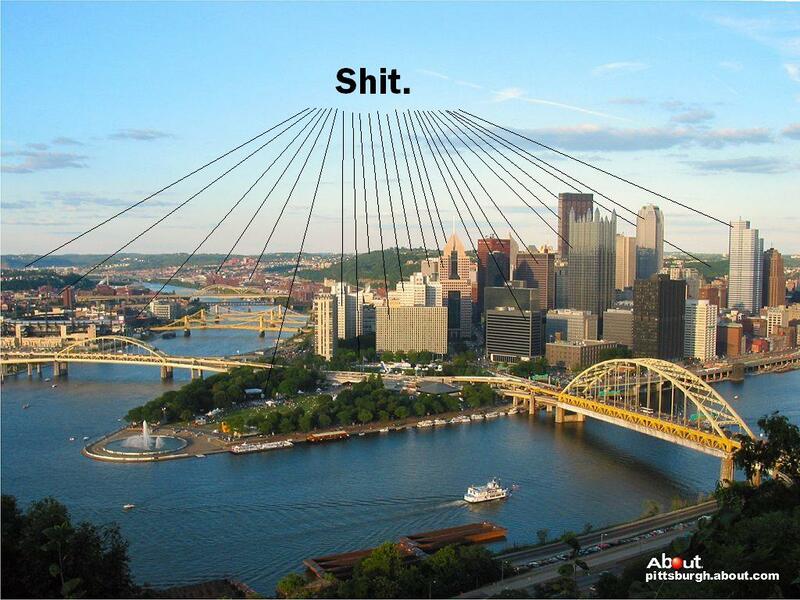 If we define ourselves by her/his/their (whoever PittGirl is or was) worldview, then I don’t want to be a Pittsburgher. That’s the problem. This region has an identity crisis. Why can’t we be like New York or Chicago and just all be who we want to be individually? Then Pittsburgh becomes truly diverse and not this place where belonging means wearing mesh Steeler jerseys every weekend. ARGH. But your characterization of Pittsburgh as a “simple-minded” and “mediocre” town is so far off base that I wanted to respond — so I went ahead and approved your comment, even though you’ve left identical remarks on at least a half-dozen other blogs run by friends of mine. PittGirl was popular because she’s entertaining. She did a remarkable job in pointing out the faults of Pittsburgh, but did so deftly, always reminding her readers why we should love this town as well. I agreed with most of what she wrote, but not all. And I can recall a number of instances when readers let her know when they didn’t agree; in fact, I recall a few times when she wondered on Twitter whether she had been wrong on a particular issue, based on the feedback she received. I’ve lived in the region for about 14 years now, and for most of that time I’ve thought that Pittsburgh’s biggest problem is people who have lived here for their entire lives don’t always see what the city and the region have to offer. My wife and I have been impressed enough not only to stay, but to buy a house — in the city — in part so we can be in a better position to take advantage of what available. I can understand that people of my parents’ age might pine for the old Pittsburgh — the one that made steel for the world, the one that provided jobs for anyone who needed one. But I’m guessing you’re not of that generation. Do you really think there’s nothing here? Or are you content to drive your SUV back and forth between Wexford and Downtown without stopping? I have a fair amount of friends in the area, thanks to work and the social media community around here. We have some common interests, sure, but the group I know is staggeringly diverse. Different politics, different arts interests, different music, different jobs, different lives … but a couple things we share? I don’t think we’re bored. I don’t think we’re simple-minded. And I think we like being here. Look — I’m a Browns fan, and I don’t like all the damn Steeler jerseys either. But anyone who thinks Pittsburgh’s identity starts and stops with football needs to open their eyes and look around. Maybe the problem isn’t football jerseys. Maybe the problem isn’t that there are an awful lot of people around here who are going to miss a blog they read every day. Very well written, Uncle Crappy…. @unclecrappy: That’s what I was really thinking. All of it. Previous PostPrevious 17. AUC: college football edition II. Next PostNext 19. news flash.